FREE memberships only available currently. Business Pro & Board Room memberships coming very soon. Your Business Skills Studio membership comes packed to the brim with the skills, knowledge & know-how that you need to build the business that you’ve always wanted. Memberships start with being able to access a host of valuable resources via the website and your Inbox as well as providing more tailored support to help you make your transition into successful, profitable, growing business. If you are ambitious for success, you know you are capable of more and you want to create a business that fills you with pride, then sign up now for one of our membership levels. What’s included in our memberships and which one is right for me? Choose your level and sign up below! This will give you a once a month live free training in a hot relevant business topic plus access to our resource bank of factsheets, how to guides and short video tutorials. Free membership also includes some other goodies including participating in all our 30 Day Challenges (we have 4 planned this year) & of course you will receive our regular news & skills updates by email. Members will benefit from our Monthly Masterclasses where we will use share the inside knowledge from our favourite business experts to bring you the latest skills & knowledge needed to boost your business. 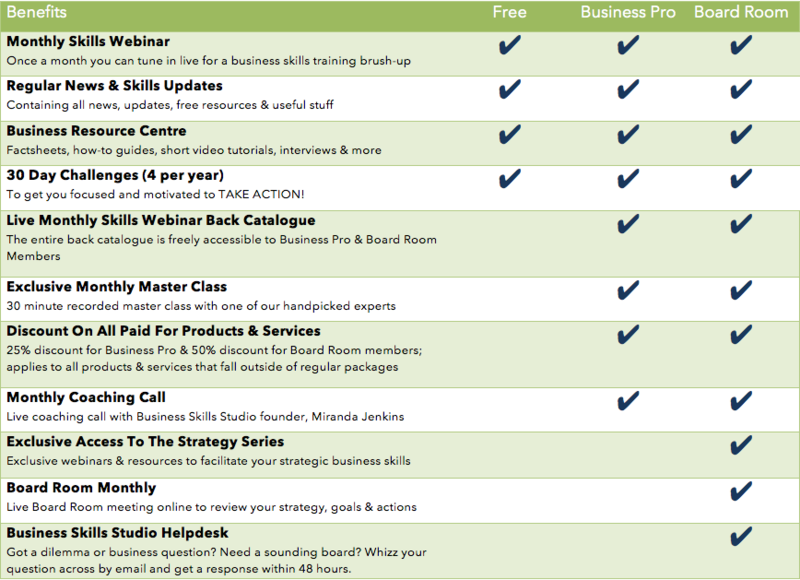 You also get free access to the back catalogue of monthly skills webinars and qualify for 25% off any paid for products/services sold through the BSS site. Finally – as part of your Business Pro package you can participate in a live coaching call with Miranda Jenkins who can answer your questions, get you thinking differently and help you deal with challenges. Board Room membership takes things to a whole new level! We’ve been helping business owners to think and act more strategically with some amazing results via a strategic group who have been meeting for the past year! Board Room members participate in our Strategy Series – exclusive webinars and downloadable templates to get you working ON rather than IN your business. Oh, and Board Room members can also take part in an exclusive online Board Room Monthly meeting with Miranda, where you can work on your strategy, set goals and review your actions regularly so that you think BIG, set appropriate GOALS and take smart ACTION. Finally, this level of membership gives you 50% off any paid for products/services sold through the BSS site and the exclusive feature of the BSS Helpdesk, where you can submit questions and get quick answers to help you through a business challenge or dilemma. Get involved in our entrepreneurial community and build your amazing business with the help of one of our Membership packages. - Register for the next free business boosting skills webinar. 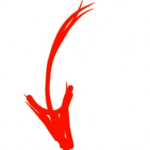 - Would a Strategy Session bring you the Business Breakthrough you deserve? Business Skills Studio t/a Skills to Go Ltd - Registered in England and Wales, Company Number: 09794747 Registered Address: 2 Broadleaves, Ross on Wye, Herefordshire, HR9 7UY | © Business Skills Studio. All rights reserved.